It has been great learning from Anastasia Pollard over the last couple of weeks. 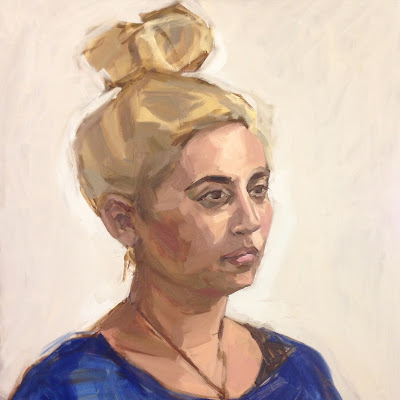 She has a very different approach to portrait painting than anything I have done before. My painting style tends to be very fast and a painting will be complete in just a few hours, whereas in her approach she will work on the same piece over multiple sittings. Because of this, I found it rather daunting knowing what to do next. At the stage I would normally have stopped, I was forced to continue and develop the painting even further, something well out of my comfort zone! One thing Anastasia said that I can really relate to is that she only ever paints for 4 hours as this is when she can get the best results. I definitely agree with this, painting is exhausting both physically and emotionally. Although at this time I don't think this slower approach to portrait painting is one that really suits me, I've found it an invaluable experiment and one that I will definitely explore again in the future. I'm really interested in how other people approach their work as I think there are definitely lessons to be learnt from each other's methods. Leave a comment to share how you approach your paintings.